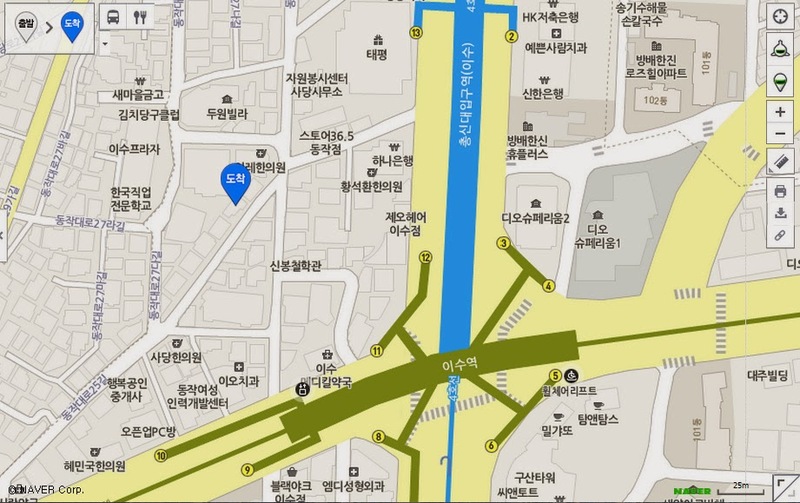 So here's an all too plausible scenario in Seoul- say you and your friend are out and about and feeling peckish. Some of your friends are suggesting getting spicy ddeokbokki while others of you are craving chicken. What's one to do in such a situation? Why, get both of course! After visiting a friend living near the Isu/Choongsin University area one Sunday afternoon, we started looking up places to eat for dinner when this spot grabbed our attention. In addition to having the popular jjim dak (which just so happens to be one of my favorite chicken dishes) on the menu, Myeongrang Jjimdak has an interesting fusion dish of dak bokki which- if you can piece together the puzzle- is a combination of jjim dak and ddeokbokki. Seeing as how both are dishes Koreans do fondly love, we had to go with it. Tucked away in the eating/drinking area of the town, Myeongrang Jjimdak has a very clean and modern look inside- not unlike a popular chain restaurant in Gangnam or Myeongdong. Sizes for most main dish orders come in small, medium, and large with the serving portion for 1-2, 2-3, and 3-4 people respectively. You can get the regular Jjimdak but the popular option is the Dak Bokki. There's also a "cheese hot jjimdak" which is a spicier jjimdak with cheese melted on top- a generally popular combination for Korea's ladies. Whatever your main dish is, you can also add toppings such as udon noodles, dangmyeon, mandu, veggies, and cheese for between 2-4,000 each. Bowls or rice are 1,000 won while fried rice (for the end of the meal) is 2,000 won a bowl. After making an order for the medium-sized dak bokki (27,000 won)- with dangmyeon added-, we waited before the banchan came out. Kimchi, dongchimi, a shredded cabbage salad, and some onion and pepper pickles are the simple offerings. Nothing remarkable or noteworthy but good enough. Gas burners are placed on the table before the big ol' metal pan of jjimdak is brought out. Rice cakes, dumplings, chicken pieces, vegetables, and more come swimming in a deep red sauce. Thankfully the ingredients come already pre-cooked for hungry guests so you don't need to wait long after turning on the burner. The servers are mostly attentive and after giving it all a mix or two you can get cracking on what's before you. The chicken pieces were pretty juicy and worked well with the onion slices, sweet potato, mushroom, and more. Sauce-wise it's a bit on the sweet side with ever a slight spicy note but far less than your average ddeokbokki. The bits of perilla leaves add a nice occasional zesty note but I only wish there was more of it added. Adding the glass noodles to soak up the sauce was fun as was stir frying in the rice. And you know, I love me some fried rice at the end. For all our expectations, the dish turned out to be just a bit above average. It's essentially more a dak bokkeum tang with rice cakes added in it and I guess I expected something more riveting or inspired. Those who aren't a fan of too spicy dishes may find this interesting hybrid but still very Korean dish to his or her liking. Otherwise, it's a clean and nice place but certainly nothing worth coming out of the way for. It's pleasant and versatile enough to cater to just about everyone which is the real attraction of Myeongrang Jjimdak. But perhaps because it caters mostly to young college students nearby, the tastes tend to be a bit on the sweeter side and the food is just fine but nothing memorable. Come out of exit 13 of Isu Station and walk straight past the big Taepyeong department store. After passing the department store, a big alley should be seen on your right. Enter the alley and walk about 50 meters until you get to an Angel-In-Us cafe that's right in the center of a four way intersection. Facing the Angel-In-Us, look left and you'll see the intersection split into two alleys with a triangular shaped red brick building sitting in between the two alleys. Go down the alley to the right of the red brick building for about 25 meters and you'll see Myeongrang Jjimdak on your right. You can download a coupon to get 10% off your total purchase. This coupon must be used within same day as your visit and only a limited amount of coupons are available for download each day. Click here to download the coupon on your phone! If you place your order to go, you'll get 2,000 won off your order. Lastly, a special lunch hour promotion goes on between 11 AM and 3 PM on weekdays. Between noodles, a soft drink, and fried rice at the end, you can choose to receive one of those for free if you order a small main dish, two choices if you order a medium, and all three if you choose a large.